At the exhibition of science, art and technology, the CONICET has recreational and educational facilities for all the family. Argentine President at the inauguration of Tecnópolis. Photo: CONICET Photography. 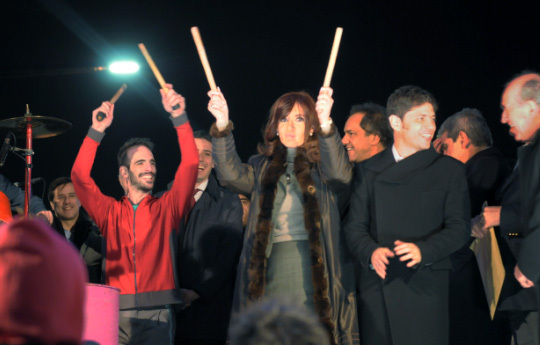 President Cristina Fernández de Kirchner inaugurated Tecnópolis 2015 under the slogan “Futuro para siempre”. The event was presented by the minister of Science, Technology and Productive Innovation (MinCyT), Dr. Lino Barañao; Buenos Aires province Governor Daniel Scioli and other national authorities. The objective is to show research and development that have direct impact and improve the quality of life of people. Besides, it will bring students closer to the fascinating world of science to arouse their interest in it. At the Technology Space, visitors will be able to see the interactive facilities that show the applications of five vital technologies for the growth of the country as regards: Energy and Environment, Agro-Industry, Electronic Engineering and Materials, Health and Social Development. This area also has a stand for Y-TEC, the company created by YPF and the CONICET. CONICET Institutional shows the history of the Council, significant figures, and important events that marked the development of the institutions in its different stages: the most relevant facts, the Argentine Nobel laureate and current information about the Council will be available in a timeline. Children can play to be “Scientists for a day.” A unique experience in which they will participate in a world of experiments that seek to awaken their scientific vocations. With laboratory clothing, children will have the opportunity to understand how a microscope works and they will be on the cover of a scientific magazine. Science documentaries are the main attraction in the Scripts and Films room, where people can watch videos produced by CONICET Documentary. Besides, visitors will be able to be the directors of their own “Scientific Documentary.” The best productions of each week will be recognized at the end of the contest and will participate for a prize that will encourage competitors to go on exploring the genre. The room is designed to show documentaries and provide scientific promotion talks. Thus, all visitors will have a space to interact with CONICET researchers and expand their knowledge about science and technology. The museum objects also have their own space in Tecnópolis. At “A walk around the world of Science and Technology”, there will be objects that marked the evolution of technology. Furthermore, there will be a stand of the Council: CONICET Information, where visitors will have access to information regarding fellowships, studies and requirements to participate in calls. There will be computers available for more information about the Council. During the winter holidays, Tecnópolis will open all week and from August 5th, it will be open from Wednesday to Sunday. As regards the election days, on August 9th and October 25th, the site will be closed as well as on the days of heavy rain.